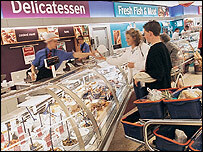 UK supermarket Sainsbury's has reported higher sales after supply improvements made more goods available for shoppers. It said like-for-like sales had increased 3.7% during the 12 weeks to 26 March against a year earlier, while sales excluding petrol were up 1.7%. The group has been working hard to improve stock availability, by tackling IT and delivery problems which had badly disrupted its supply chain. Sainsbury's has been fighting hard to recover from years of underperformance. Shares in the firm rose 6 pence, or 2.09%, to 293 pence. Sales increased 7.2% during the three-month period - or 5.4% excluding petrol sales - against the previous three months, as the group managed to make more products available to shoppers. The UK's third-biggest supermarket added that while price cuts had not drawn more shoppers into its stores, they had helped to lift sales, as had increased business for Valentine's Day and Mothering Sunday celebrations. "We recovered well from the Christmas and New Year peak trading period," said chief executive Justin King. Analysts were encouraged by the performance saying the group may now have turned the corner. "It's pretty encouraging they are showing the green shoots of recovery, but it is early days," Iain McDonald, an analyst at Numis Securities said. "They've gradually improved market share in the last few months, the tough bit now is converting that to profit." Mintel retail analyst Neil Mason added: "Basically it comes down to product availability. Before Christmas they had big problems with the supply chain and now they're adopting the right strategy." However, he added that while price cuts had lifted sales, it could hit the group's profits. Despite the improvement, Mr King warned that the group continued to battle in a competitive environment, adding that "in these circumstances we are particularly pleased that we have seen an improving trend in sales". "Our major focus on availability is beginning to show results with both colleagues and customers noticing improvements in store," Mr King added. He also said that the group was confident of achieving its sales targets for 2005/6 despite fierce competition. Sainsbury's has been facing increased competition from rivals Asda and Tesco, while Morrisons' takeover of Safeway has created a larger challenger to the big three names. However, Mr King said Sainsbury's may have benefited from the Safeway takeover, with some former Safeway customers now defecting. "I think that the things we do really well - which is fresh food, the range that we offer, the service that we have at our counters - are all things that some customers are struggling to find in converted Safeway stores," he said. Can Sainsbury's rise to the challenge?